Another model manufacturer is also now producing a model of the E400MMC : by the name of Model 1. 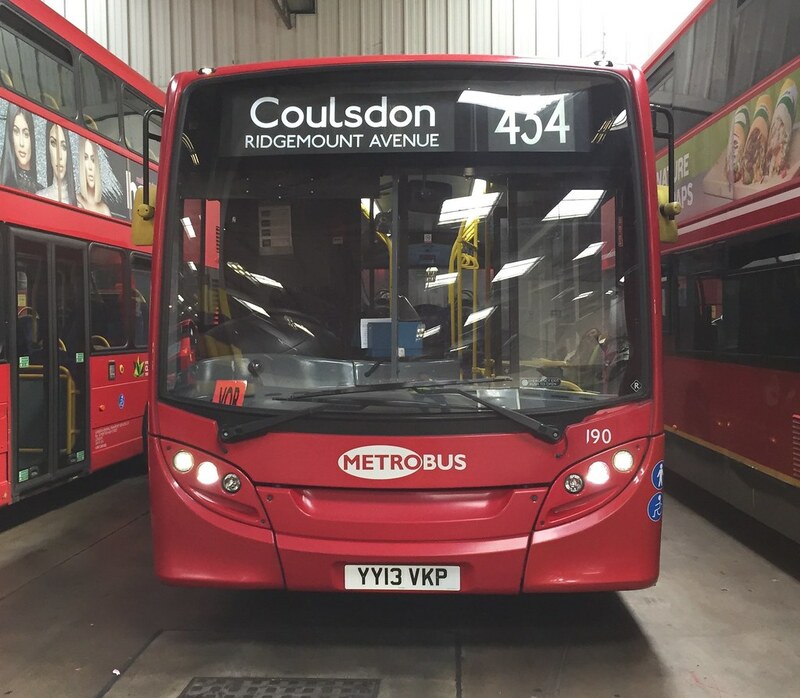 They are also producing an E200MMC : once again for Abellio (route C10) and Stagecoach (499). Was hoping for a Go Ahead version E400MMC as I would have tried to apply improvise blind sets for a Merton route. I'm may go for both of the Abellio variants. In addition to those, though not London-related, they have also announced the Volvo B10M / Alexander PS. The first releases will unsurprisingly be in Stagecoach livery, but the exact buses are still to be confirmed. This is all interesting news, though compared to the Northcord E400 MMC it's less clear as to exactly which variants they are tooling up for. Both of the London models announced by Model 1 are hybrids, while Northcord also produce the dual door diesel version and have plans to make the City as well. The three E200 MMCs announced are all different lengths (the provincial Stagecoach bus being 11.5m, Stagecoach London 10.4m and Abellio 10.8m). It would be great if they are indeed to produce several lengths of the model but other manufacturers have "cheated" in the past, such as several Dart / Pointer models by EFE using their 10.7m tooling to model 10.1m vehicles. With the level of detail Model 1 are promising for these, and have included in their Hong Kong models, I'd hope that wouldn't be the case here but I still can't help being a bit cautious. With the lack of further information and my almost complete lack of knowledge of any differences between the real Hong Kong buses they have modelled, there isn't much to go on as yet. Still, whichever length and door combinations etc they are doing, I'm sure they will be very good models and it's certainly great to have another manufacturer, even if it has resulted in a duplicate. I'm looking forward to the E200 MMC being released, however with E400 MMC I'll probably go for Northcord's on the basis that we know they will be covering many different variants. Do Northcord plan on casting the E200MMC or are these going to be left to Model 1 to cast? I like the idea of Model 1 detailing their interiors but I'd much prefer Northcord. The first MMC's should've been released this month, but they seem to have been delayed, although I have seen preproduction models of the NXWM model. Northcord haven't announced an E200 MMC, that doesn't mean they wouldn't in the future but it's probably less likely now that Model 1 are to produce that type. The British Model Buses website has images of a production model of the Go-Ahead London E400H MMC along with a press release from Northcord announcing that model's release. So it appears it is or will shortly be out in Hong Kong, and the UK release date for Northcord models has usually been around 6 - 8 weeks later which would put it sometime in March. Model 1 are a bit of an unknown quantity, but their Hong Kong models are first class. Re. Northcord - don't know is the straight answer. They have had a number of fallow years, so it will take them time to get back up to speed again. It looks fantastic and I can’t wait to get my hands on one! The stagecoach version is UKbus6503, both model around £48 each on pre-order. Would you possibly have a link for the Stagecoach E400MMC on Route 53? £48! No wonder I stopped buying model buses. Indeed and why my own collection stopped at three models, all second hand and purchased at much reasonable prices. Words and photographs of the real bus are all I have at the moment. Once I get a pic of a pre-production sample, I’ll post a link here. I have rather more than 3 (!) - I could probably out gun some of the large London garages in terms of vehicle numbers. However they were bought a fair number of years ago before the industry went crazy with endless numbers of models and then sort of collapsed under the strain. Prices then rocketed for a load of reasons. I also managed to pick some stuff up relatively cheaply in Hong Kong from 80M Model Shop branches and also from Jotus. Not sure I have the space for anymore anyway. Just seen the go ahead one looks so neat! !